These apple muffins are topped with a cinnamon sugar blend before baking. These apples are perfect for fall mornings. Bake a batch and take them to the office, or include them in lunchboxes. They're excellent for holiday mornings, too! Grease 18 muffin cups or line with paper liners. In a mixing bowl, whisk together the egg, apple juice or milk, vegetable oil, and vanilla until well blended. In another bowl, combine the flour, sugars, baking powder, and salt. Stir to blend thoroughly. Stir the flour mixture into the egg mixture just until flour is moistened. The batter will be a little lumpy, but that's okay. Stir in the chopped nuts and chopped apple. 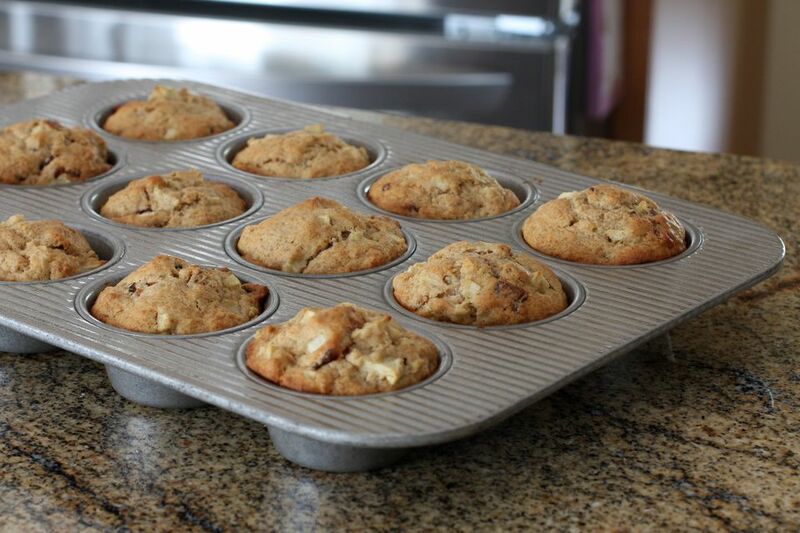 With a spoon or scoop, fill the prepared muffin cups about two-thirds full. Sprinkle some cinnamon sugar over the top of each muffin. Bake for 16 to 20 minutes or until golden brown. *To make cinnamon sugar, blend about 1 1/2 teaspoons of cinnamon with 1/4 cup of granulated sugar.